If you're a 'DIY-er', I'm sure you've spotted something in a store before and thought, "I can do that!". That happened to me this past spring when I was at the Country Living Fair. I found this amazing leather and lace bracelet that was so cute. I loved it but it was too expensive, so I set out to recreate it even though I'd never worked with leather before! The bracelet that inspired this project! 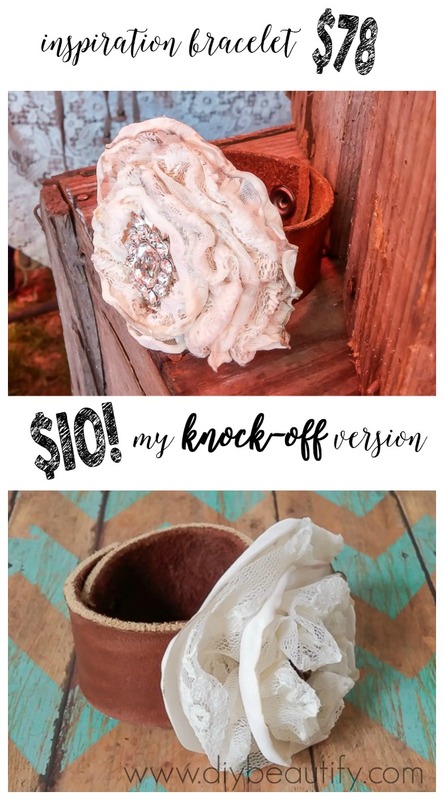 I especially love the rustic leather combined with the feminine lace and satin flower (and of course the little bit of bling) and I'm guessing you might just be smitten with it as well. And it was much easier to make than I was expecting! Here is the tutorial so that you can recreate this ultra feminine bracelet for yourself. Affiliate links are added for your convenience. You'll find my full disclosure policy here. 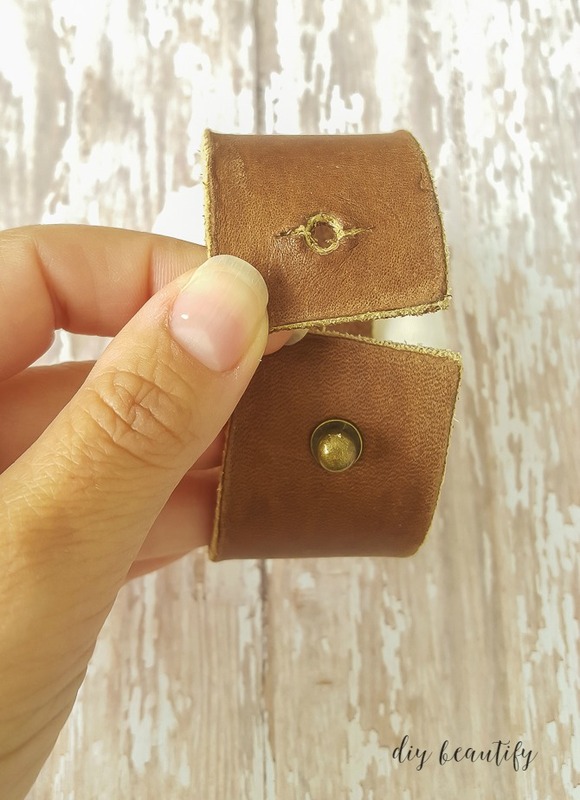 Measure your wrist and cut the leather to size, allowing about 3/4" overlap to attach the fastener. I actually used heavy duty kitchen shears to cut the leather into a strip, and they worked well. 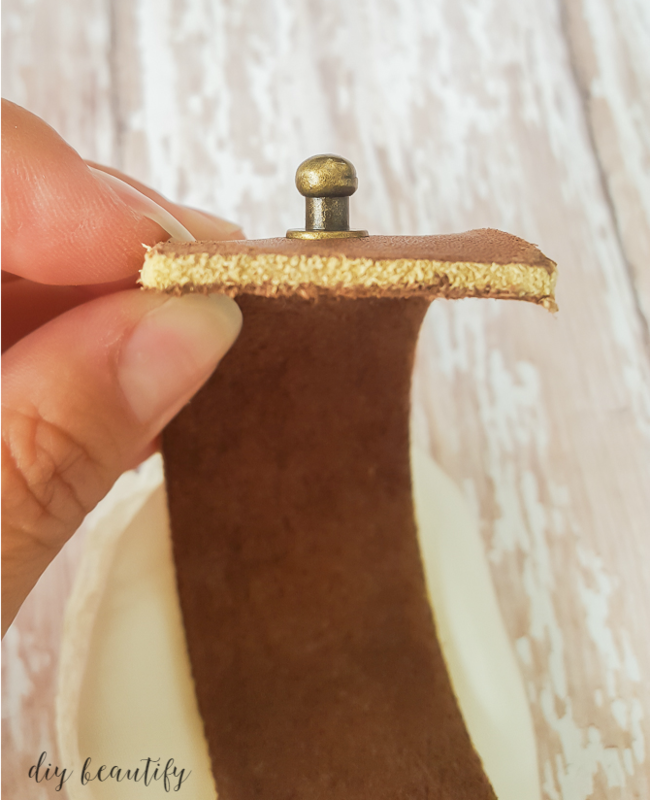 Use a small piece of sand paper to rub along the cut edges and smooth the fuzzies. You can see that my leather is a little bit wonky; believe me, you will not notice any minor imperfections once the flower is added! Using the awl or Crop-a-Dile, punch a hole in each end of the leather strip in the middle and about 1/2" in from the end. Following the directions on the package, attach the fasteners. I was unable to find snap fasteners with a long enough post to fit through my leather, but I did find these Tim Holtz Hitch Fasteners and they worked perfectly! They are different from snap fasteners in that both pieces are attached at the same end of the leather strip. You're left with a little ball sticking up. 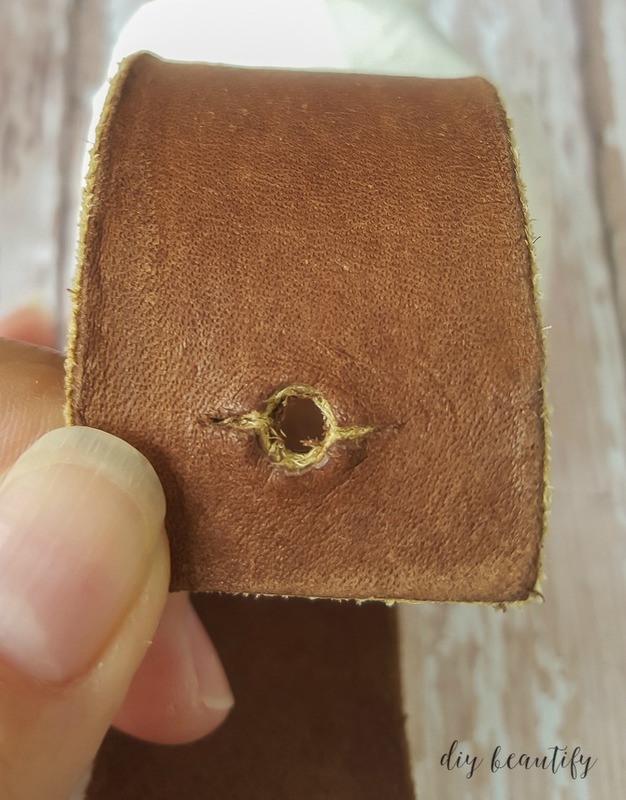 Then in the other end of the leather, you'll need to slice a small slit with a craft knife through the hole you already punched so the ball can poke through. That's how the bracelet attaches. You can see how easy it is to get on and off. You want a snug fit, so don't make that slit too big! 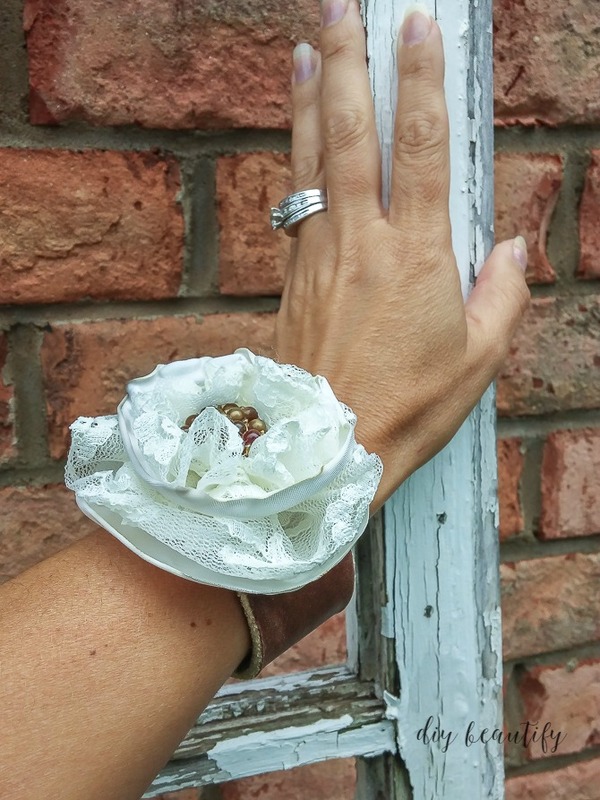 The best part of this leather bracelet, in my opinion, is the gorgeous satin and lace flower. I'm going to redirect you to watch this video that I shot when I created a similar flower for my embellished hat. The only thing I did differently for this bracelet is that I added a couple layers of ruffled lace (using this tutorial) in addition to the layers of satin. Once my flower was finished, I glued a vintage button (from a coat my m-i-l had years ago) to the center of the flower and then glued the flower to the center of my leather bracelet with E-6000 glue. I rested a heavy object on top until the glue set, about 2 hours. Isn't it pretty...feminine and rustic all at the same time. My total cost was only $10! 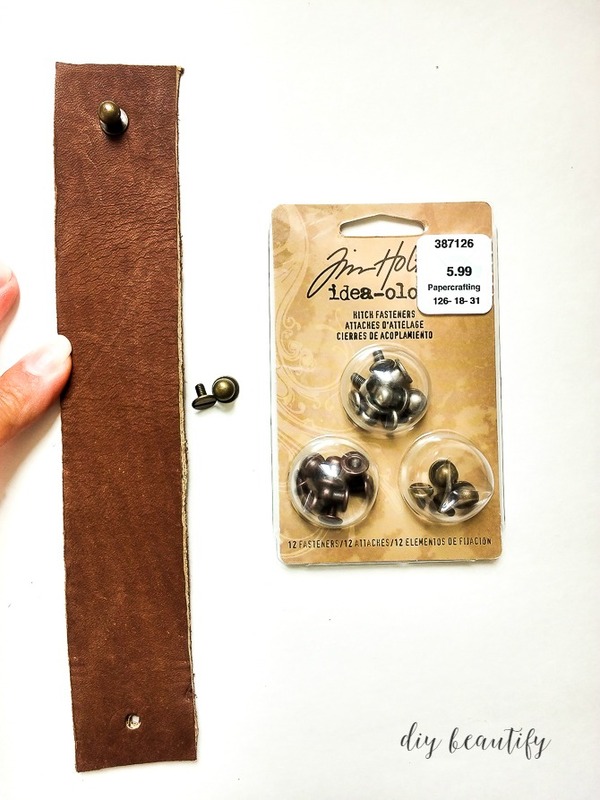 I already had many of the supplies listed on hand and just needed to purchase the leather and the fasteners. 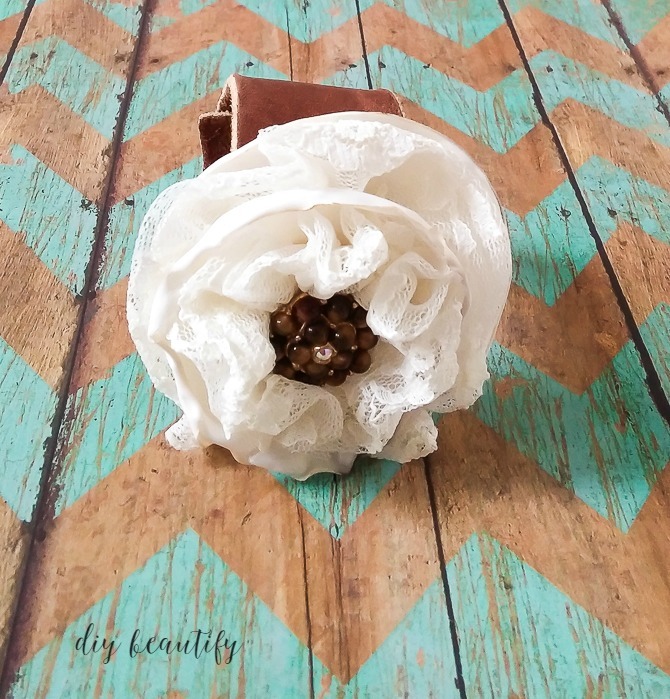 I am tempted to wear this leather and lace bracelet with just about everything! ...as it does with cooler ones! I LOVE it with my leather boots! And how do you like the savings? Pretty amazing, right? Now that I know how easy it is, I plan to make more! In fact, I want to make one with even more ruffly layers and lace...and I'm on the hunt for a vintage pin to use in the center! Wow. I love your bracelet. I would love to try to make one. It really is beautiful! Great job!! Thank you Stacy, your comments are so appreciated! I hope you make a bracelet for yourself!! Beautiful! 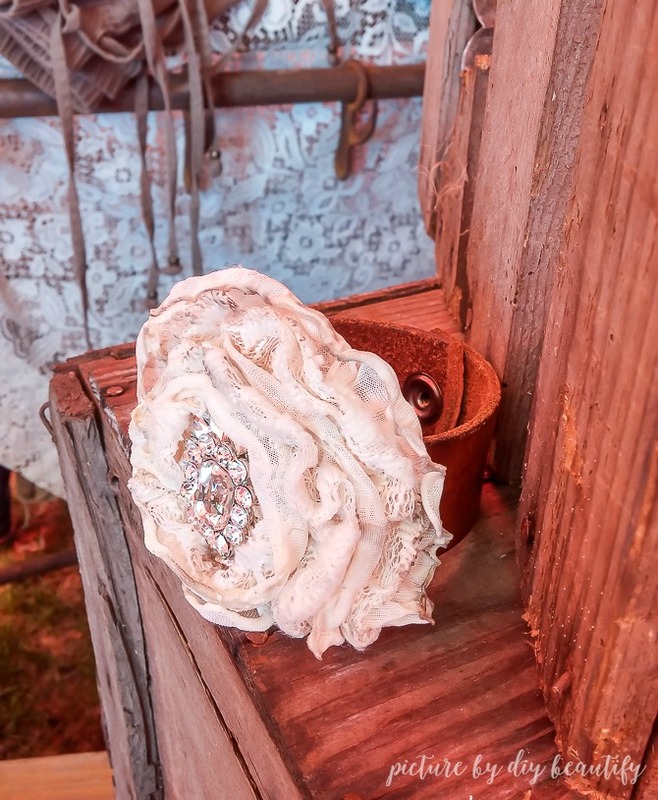 I think this bracelet can be worn on rustic weddings. I agree, that would be stunning! Thank you for your comment!